In this game you will be the most exciting racer! Just take your bike and pass each stage easily! Be ready for some impediments and you will cope with it. Just drive the bike and do it as better as possible. We wish you good luck! Do not let your chance to slip. You have a great chance to hop on your bike and pull jumps and adrenaline pumping back flips through the crazy and dangerous snowy terrain, is it clear? 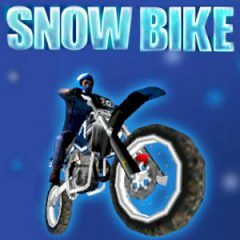 So, a lot of levels of extreme action and height will leave you wanting more trial bike games in an instant, just try to avoid obstacles and land your jumps just right or risk falling off your bike game and landing face down in the snow. Just step on the juice and try to win each race. Everything is up to you! Enjoy the game and be ready for many obstacles. Have fun!